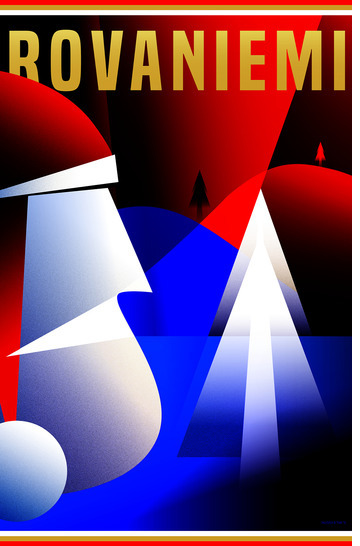 Participant in the MyFinlandPoster contest in 2017! In the Netherlands I wasn’t taught a lot about Finland. However, being married to an Estonian with Finnish roots, I have learned a lot more about Finland in the last couple of years. 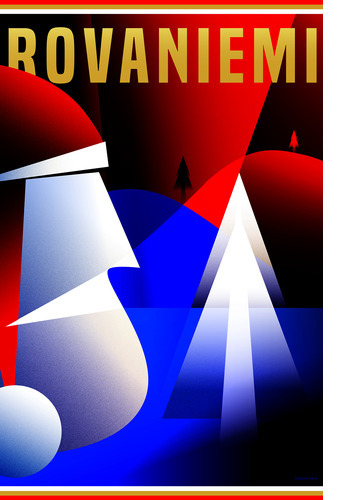 And one of the things is that Santa Claus actually has it’s official hometown in Rovaniemi and does not drive around all the time in an American Soda beverage truck. 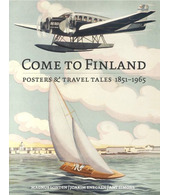 While thinking of a subject for the 2017 poster competition, I looked through the vintage travel posters made of Finland for inspiration and it occurred to me that there are not many posters covering this subject. Therefore, I decided that I wanted to highlight this area of Lapland and the hometown of Santa Claus: Rovaniemi in the most minimalist way I could do. Surely travel posters can’t simply remain a cry from the past?Absolutely not. We live in a completely visual world where the picture is stronger than ever. That’s why the following question hit us: How would contemporary artists depict Finland of today?